The Sheraton Cable Beach Resort, formerly the Radisson Cable Beach Resort & Golf Club, is probably one of the most underrated destinations on the island. Over the last several years I’ve stayed a number of times on the property and I’ve watched it grow into a classy, family-oriented resort that can compete with any in the Bahamas or the Caribbean. Add a fine golf course and The Sheraton Cable Beach Resort makes for a great golf destination. The hotel forms a great protective semi-circle along one of Cable Beach’s finest stretches of sand. Barely more than walking distance from Nassau proper, it handily located for those who, as my family does, like to be close in to “things to do.” Though there’s not nearly as much going on at the Sheraton as there is at Atlantis, just across the water on Paradise Island, I think, it is not lacking in appeal, especially for those who like things a little less crowded, less noisy, and less expensive. 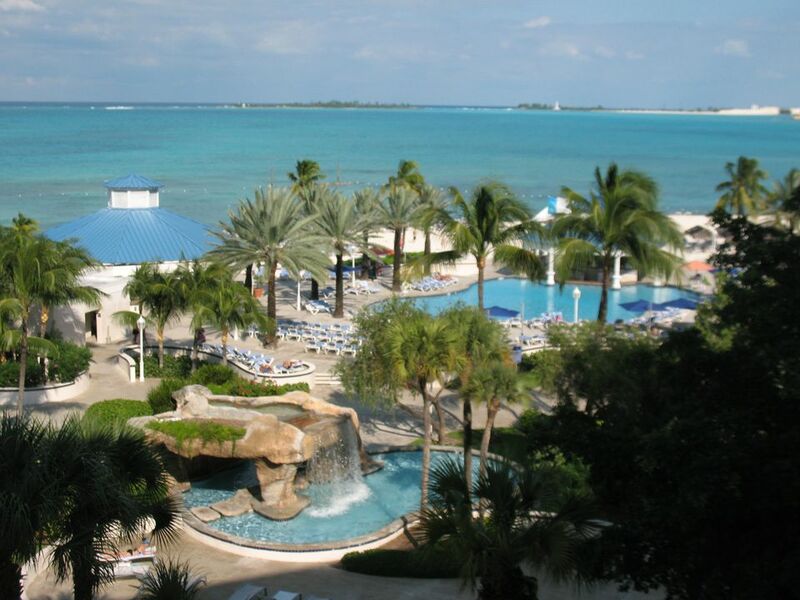 There always seems to be plenty of space on the beach, the three pools are rarely crowded, and the bars offer all you could ask for and more at reasonable prices, comparable to anywhere else in the Bahamas. On the downside, if there is one, the staff, at times, seems to be a little off-hand, and the service in the two most popular restaurants a little slow. In general, you should always expect to get what you pay for; here at the Sheraton I think you get a little more than that. There are six specialty and gourmet restaurants. Comfortable guest rooms have fabulous view over the ocean, beaches and gardens. One of the best private beaches on Cable Beach is here at the Sheraton. There are two bars, three pools, three squash courts, 15 tennis courts, Camp Junkanoo for the kids, baby sitting, beauty salon, shops, a casino right next door and, of course, 18 challenging holes of golf. And, talking about golf, the Sheraton's newly redesigned golf course plays 6,453 yards and features spacious fairways guarded by a beautiful network of lakes. The greens are protected by a series of multiple mounds to create containment and to assist the golfer who occasionally strikes a stray shot. Additionally, the course features a minimum of sand bunkers making it a challenging but "resort friendly" course for golfers of all skill levels (a unique concept in this age of championship only courses). There's also a fully stocked pro shop where you can rent or buy equipment. And just because the sun goes down doesn't mean you have to abandon your love of the game. The club also has a lighted driving range so you can continue to hook and slice way on into the night, if that's what you want. Better, I think, is to retreat to one of the resort bars for a few soothing beverages and some lilting Caribbean music; the perfect way to calm the nerves after a round of golf that might not have gone quite the way you would have liked. The Islands of the Bahamas are served by two international airports, but in this case Grand Bahama International Airport is the one you'll need. The airport is served by almost all of the US domestic airlines as well as airlines from Canada, the United Kingdom and Europe. Finally, if you're thinking of visiting one of the Out Islands, you can do so from Freeport via Bahamasair. Bahamasair offers regular scheduled service to the Abacos, Exumas, and most of the smaller inhabited islands.